Learn about all the features of your DUO or DUO+. Find the technical specifications for your product. Follow an easy step-by-step trouble shooting guide for the DUO and DUO+. No Power – My Network Unit (aka Window Unit) won’t turn on! No Power – My Coverage Unit won’t turn on! The numeric (8-segment) display on my Coverage Unit keeps cycling/rotating. DUO+ for Verizon is not boosting my voice service. No LTE – My phone still doesn’t have LTE! Small Coverage Bubble – I only have signal within a few feet of the Coverage Unit! If, after switching power supplies both system are functioning properly then your Cel-Fi DUO system simply needed a restart. This is not something that should continue, but if it occurs frequently please reach out to your point of sale for support. are functioning properly then your Cel-Fi PRO system simply needed a restart. This is not something that should continue, but if it occurs frequently please reach out to your point of sale for support. When your system does not power up, or has a red power indicator, one of the following things could be happening. You might have a power adaptor failure, a hardware failure, or the system may need a simple restart. If, after switching power supplies, you still have no power on your Coverage Unit try another outlet, or another lamp/appliance in the same outlet. If you continue to have problems with the unit please reach out to your point of sale for a system replacement. When your Coverage Unit displays a rotating “0” zero your system is still preforming startup procedures. This process usually takes less than 20 minutes. If it takes longer than 45 minutes, please restart both units. Cel-Fi DUO+ for Verizon is LTE only and will only pick up your Verizon LTE signal. If your phone is not compatible with VoLTE (Voice over LTE) your voice service will not be boosted by the DUO+. If your phone is compatible with VoLTE make sure that your phone has LTE at the location of the Network Unit. To confrim, walk to the location of your Network Unit and place a call, if your phone switches to 3G your phone may not be compatible with VoLTE. There are a few reasons why your phone would experience an issue with the LTE service. 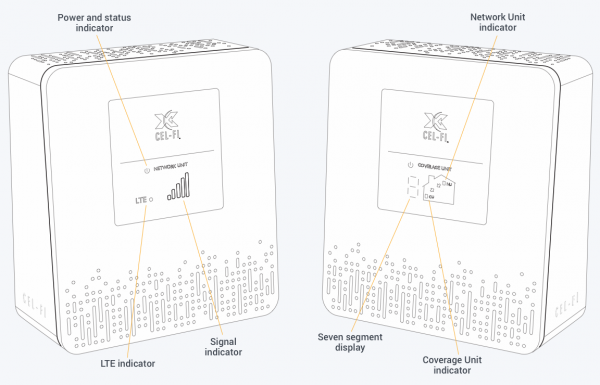 You may not have LTE in your area, your Cel-Fi system may have lost the LTE signal due to intermittent network outages, your phone may not support LTE, or your phone may not be compatible with the frequency being boosted by the Cel-Fi DUO. When you have a display of 0, 1, 2, 3, 4, 5, or 6 your Cel-Fi DUO system has established a connection but is not working to the fullest ability. Try this… move your units further apart. 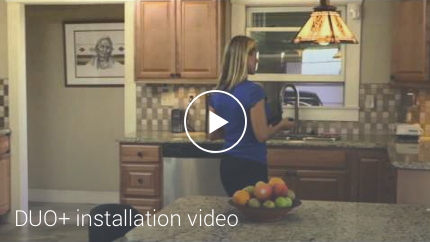 If you have a particular spot in your home that you want coverage more than others try installing your Cel-Fi system in reverse. Put your Coverage Unit where you need coverage the most then place your Network Unit at the furthest location where you can get at least 1 bar of service. The more bars shown on the Network Unit the better. 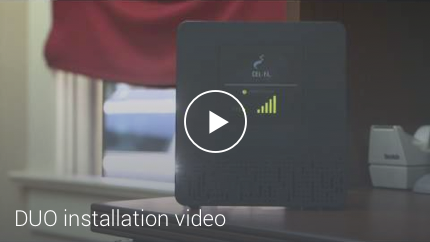 Try moving the Network Unit to an area that has better 3G/4G/LTE coverage. If the home/office has more than 1 floor upstairs is usually better than downstairs. Putting the Network Unit near a window or higher on a shelf often helps as well. The numeric value on the display of the Coverage Unit is an indication of the area covered. A higher number means a larger area is covered. To increase the coverage area move the Coverage Unit farther away from the Network Unit. The less obstacles in their direct line of sight the further apart you can get them. The higher the Coverage Unit number, the better the coverage. E1 – Cellular Signal too weak to boost. Try this… Walk around your home/office with your cellular device. Try to find a signal indoors with at least one consistent bar of 3G/4G/LTE. More bars is always better! Once you have found a usable signal place your Network Unit in this location. No bars with a flashing power indicator means the system is trying to locate the cellular network. This normally takes less 60 minutes. Make sure that your phone (cellular device) has at least one bar of 3G/4G/LTE signal where the Network Unit is located. E1 Cellular Signal too weak to boost. Try this… Walk around your home/office with your cellular device. Try to find a signal indoors with at least one consistent bar of 3G/4G/LTE. More bars is always better! Once you have found a usable signal place your Network Unit in this location. E2 Coverage Unit hardware error that may be remedied by a reset. Your Coverage Unit may not display a flashing error code. You will likely only see the solid red power indicator on your Coverage Unit.Try this….Reset your Coverage Unit. Simply unplug your Coverage Unit for a few seconds and plug back in. E3 Your Coverage Unit is overheating. Try this… ensure that your Coverage Unit vents are clear of any blockage, and that the location of the unit allows free flow of air. Once your Coverage Unit has cooled down it will operate as normal. E4 Your Network Unit is overheating. Try this… ensure that your Network Unit vents are clear of any blockage, and that the location of the unit allows free flow of air. If you have your Network Unit in an attic space you may need to relocate the device to ensure that the system does not continue to overheat. Once your Network Unit has cooled down it will operate as normal. E7 The system has been disabled by the mobile network carrier. Contact your point of sale. E8 Input signal too strong. An E8 error code is letting you know that your Network Unit is too close to a cellular tower, not necessarily for your operator. This has reduced the output power (coverage bubble) to limit network interference. Try this…Move your Network Unit to another location. You might need to move your system to the other side of your home. Note: When you have an E8 your system will still offer you indoor cellular coverage. Too close, you may also see a solid zero on your Coverage Unit. Your Coverage Unit is “Too Close” to your Network Unit. Try this…moving the units further apart, starting with the Coverage Unit. Intermittent rotating/too far issues. While the number 9 is the largest distance between your Coverage Unit and your Network Unit you can have the systems slightly too far apart. This may cause you to experience intermittent interference which can cause the connection to break. Frequent or intermittent issues can be related to heavy WiFi saturation in your home/office, or obstacles that move between the two units line of sight. Make sure that each unit is as far as possible from any access points or other WiFi enabled devices. An example of a wireless device could be, but is not limited to, a wireless home phone, laptop computer, or wireless router. The cellular signal is too weak to boost. Try this…Walk around your home/office with your cellular device. Try to find a location indoors with at least one consistent bar of 3G/4G/LTE where the cellular device’s performance is satisfactory. More bars is always better! Once you have found a usable signal place your Network Unit in this location. Note: If an External Donor Antenna is installed, check the connection. Your Coverage Unit may be experiencing a hardware error that might be remedied by a reset. Try this…reset your Coverage Unit. Simply unplug your Coverage Unit for a few seconds and plug in back in. If the problem persist after a restart contact your point-of-sale for further assistance. Note: Your Network Unit will continue to search for the Coverage Unit. Your Network Unit (also known as a Window Unit) is overheating. Please ensure that your Network Unit vents are clear of any blockage, and that the location of the unit allows free flow of air. If you have your Network Unit in an exceptionally warm area you may need to relocate the device to insure that the system does not continue to overheat. Once your Network Unit has cooled down it will operate as normal. Before use you must register this device. Register your system. Your Network Unit may experiencing a hardware error that might be remedied by a reset. Try this… reset your Network Unit (also known as a Window Unit). Simply unplug your Network Unit for a few seconds and plug it back in. If the problem persists after a restart please contact your point-of-sale for further assistance. If you recently updated the device using WAVE, try the update again. If the error persists please contact your point of sale for further assistance. Your Network Unit is too close to a cellular tower. This may result in a reduced output power (smaller coverage bubble) to limit network interference. If you have satisfactory boost in cellular service you can ignore this message. Otherwise move your Network Unit to another location. You might need to move your system to the other side of your home/office. Your system has been moved from its original address. Please move the system back to its original location or try to register your new address with your wireless provider. Systems can be registered HERE. Note: In some cases the Error 9 cannot be remedied with a registration – instead the remedy is to return the unit to its original location. Please reach out to your point-of-sale if registration did not unlock your error 9 message. Your Coverage Unit is “Too Close” to your Network Unit. Try moving the units much further apart, starting with the Coverage Unit. The more distance between the Network Unit and the Coverage Unit results in a larger coverage bubble provided by the Coverage Unit. Your Coverage Unit is “Too Far” from your Network Unit. Try moving the units slightly (5-10 feet) closer together, starting with the Coverage Unit. Your Network Unit will continue to search for the Coverage Unit, resulting in a flashing power indicator. Make sure that your Network Unit is operating normally, displaying a green (flashing or solid) power indicator and green signal strength bars. If you have a red power indicator (flashing or solid) on your Network Unit please reach out to your point-of-sale for further assistance.